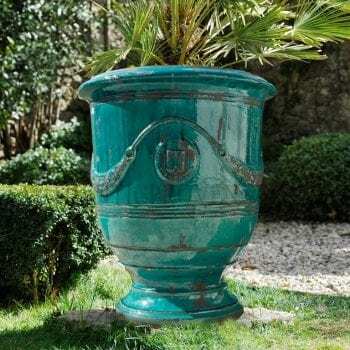 A turquoise partially glazed Anduze garden planter with an antiqued patina. Originates in the south of France and is typically adorned with swags and an emblem. Drainage hole is provided. Handmade in terra cotta so sizes and finishes may vary. These planters are not frost-proof. Categories: Garden Planters, Vase d'Anduze. 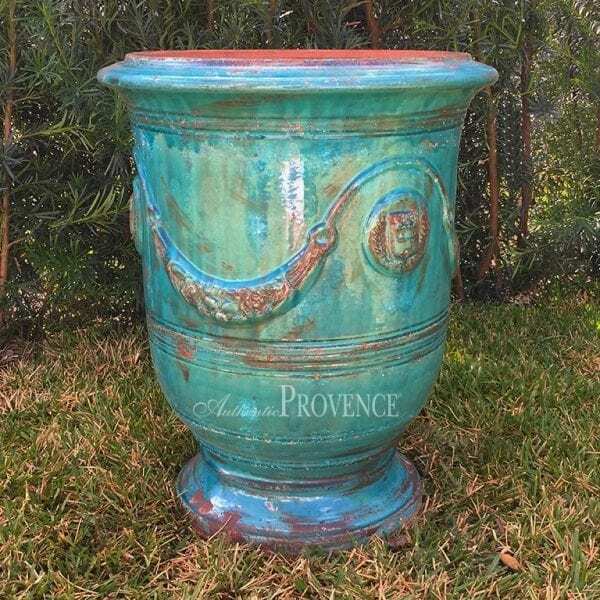 Tags: BLEU, BLUE, FRANCE, PLANTER, TERRA COTTA, TURQUOISE, TURQUOISE AGED, URN, VASE D'ANDUZE. 22 H in. x 18 W in. x 18 D in.